A Girl’s best friend still Sparkles! Diamonds are forever, but new trend colors add a sophisticated finish to the many facets of a woman’s role. Jewels and Jewelry continue to add a fascination and adornment, and our hand-picked collections are refined and add elegance to any outfit. BB1 Classic introduces Chaz, a stunning collection of luxury pieces in a plethora of precious and semi-precious gemstones. Hand-Crafted in a mixed media of gold, silver, leather and metals, new yet timeless, uniquely created with style and passion adding beauty and blends with today’s trend. Konplott debuts at BB1 Classic. 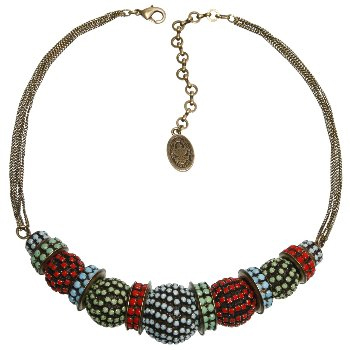 The line is spectacular, the colors are vibrant, and each handmade piece adds a touch of sophistication and mystery to the woman who wears it. Miranda Konstantinidou makes your word sparkle. 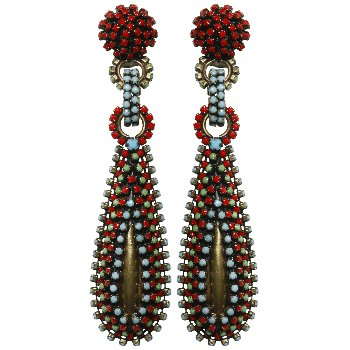 Her latest jewelry collection of Africanica hand crafted in antique brass elements, inset with multi colored stones to adorn your neck and ears, are featured at BB1 Classic. An inspirational line of 24 carat gold and 22 silver pendants with inscriptions from Greatest Hits, adds excitement. Olee’s pieces are attention-getters and create nostalgia for those who listened and rocked to these greatest hits. With the approach of Mother’s Day, followed closely by graduations, and then the holidays – not forgetting special birthdays – these are on our A list for gifts. Pieces come with a chain and O lock, are presented in a beautiful box with an inspirational message, and include a personal note card. Oh, I should say, none of these price points break any bank, all under $190 or so. Crystals are Silver Night and Jet Black to blend with trends. 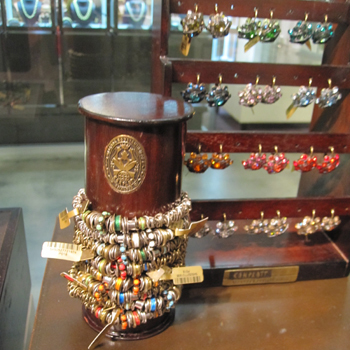 Cabochette Beads and rich colored gems help complete any outfit. A Bonnie vintage crystal neck with t shirt and jeans, or worn with a special gown, will help fulfill any gal’s dream. For 20 years or so, our silky second skin has been Liquid Metal. The patented handmade ball cuff still remains today’s favorite. It adds a special touch and has been known to sell off your wrist to those who cannot resist it for three times the price you paid for it – the call is yours. It is replaceable when in stock; we do run out.